Geologists say that before the last ice age, the Passaic River ran through the gap in the mountains at Short Hills and found its way to the sea between Newark and Elizabeth. What's left of this course was referred to as Bound Creek. According to Indian lore, this creek was the dividing line between the lands of the Hackensacks and the Raritans. 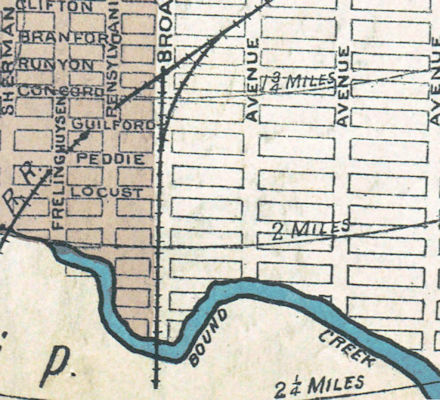 Today the creek runs through an underground conduit westward to the Pennsylvania Railroad lines and west to Meeker Avenue. Once past Meeker Avenue the creek has been transformed into Weequahic Lake.